I am giving a workshop in New Brunswick in May entailing three different segments - first I will be working with the teachers around the sensitivity and empathy that is required to mentor young musicians. Then I will work with students, amateurs and professional musicians around the psychological awareness that is needed for a healthy performing life. The third segment is going to be a master class entering on body awareness and healthy mindful and cognitive practices to help bring confidence and flow on stage. Here is a brief description of each of these segments of the workshop. Teaching with Awareness, Sensitivity, Ethics and Empathy: Teaching music to a young burgeoning musician is exquisitely complex. In this workshop we will explore the elements of mentoring that are essential to support the growth of a student so that they may learn, progress and flourish. Let us gather to begin the discussion of the challenges and the joys of this important profession. The Embodied Musician: With elite athletes it is commonplace to work with a sports psychologist. Musicians are now beginning to recognize that their mental and physical health is as important as the hours put into practicing their instrument. The Embodied Musician offers a comprehensive set of tools, practices and information to explore a variety of psychological and physical aspects of performance practice. Individual coaching sessions with Paula Wise will allow you to go deeper into the process of discovering what are the hidden blocks, specifically for you, to performing with joy and confidence. When we discover the origins of what is holding us back, we can then begin to experiment with new attitudes and beliefs that can offer us more choice and freedom in our lives and on stage. Paula’s experience as a performance coach, professional violinist and a psychotherapist is a rare opportunity to work with someone who truly understands the demands and stresses of a musicians’ life and work. "I have been incredibly lucky to work with Paula Wise for the past two years, both in private sessions and as a participant in her group workshops. Paula has helped me discover my personal blocks as a performer and has guided me through the process of understanding my own performance anxiety. She has provided me with many tools that are now part of my performance routine and preparation. Her unique synthesis of the professional musician, music teacher, and therapeutic professions creates the perfect combination for guiding musicians, teachers, and students toward a path of artistic freedom and self-discovery. This is a posting that Emily Logan wrote for the website of the New Brunswick Arts Council. She received a grant to work with me over her second year of a doctoral program at UBC for performance in piano. She is also doing her thesis on performance anxiety/wellness so the collaborative work we have done together has been rich and exciting. As children, we probably all had the experience at one point or another of answering the question, “What do you want to be when you grow up?”. I remember my friends rhyming off answers like doctor, teacher, firefighter, police officer. I, on the other hand, wanted to be a pianist. I am sure that my first piano teacher was slightly baffled when I asked her one day, at the young age of 8, how I could prepare for a career in piano. Something about the piano, its rich sound, its potential, its expressive power, began to catch my attention at the age of 3. Although the vision of my musical career shifted at times over the years, my eyes never gazed away from my ultimate goal – I wanted a career in Classical Piano. So that is how it all began! I started formal lessons at the age of 6 and have continued studying piano for the past 22 years. After high school, I went straight into the Bachelor of Music at Mount Allison University, followed by a Master of Music in Piano Performance at the University of Ottawa, and now I am halfway through my Doctorate of Musical Arts in Piano Performance at the University of British Columbia. As I look back, it’s hard to believe that a toddler’s fascination would end up turning into a full-blown career. The artistic career, I think, is one of the most gratifying and truly personal career paths that one could embark on. The experience of sharing music with an audience, gifting them with something that has a tremendous transformative power, is hard to describe. This gratification is what makes a career in the performing arts so powerful, purposeful, and rewarding for me. 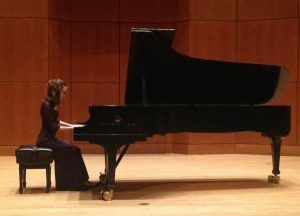 As a pianist, primarily in the area of Western Classical Music, sharing my music with others has become not only a career path but also a huge part of who I am as a person. Having said this, a career in the performing arts is not at all easy. There are the many years of training, the hours of practice, but often the sheer physical and emotional demands of artistic expression in performance can take a toll on the performer. Thanks to the generous support of artsnb, I had the opportunity to embark on a wonderful professional development project that helped me discover a path toward greater freedom of expression. Paula Wise is a professional violinist with an extensive performing career, most notably with the Vancouver Opera Orchestra and previously with the Babayaga String Quartet. In addition to her work as a musician, Paula is also a psychotherapist with a unique interest in performance wellness practice and creativity coaching. This past school year, I had the privilege of working with Paula on my artistic practice. She helped me to discover flow and ease on stage; to engage wholeheartedly with the audience, to learn about resilience and longevity in a very demanding career; to experiment with healthy performance practices in order to sustain discipline, focus, and inspiration; to achieve clarity in my unique goals and motivation; and to develop an authentic creative musical voice. Since beginning this program in September of 2017, I have seen tremendous results. This program has had a remarkable impact on my performing abilities and my love of the stage, which are both already leading to increased success in my career. This mentorship program certainly had a transformative effect on me as a performer. Professors, colleagues, and friends have all noted a significant increase in my ease and security on stage. Personally, I am beginning to find a place of greater freedom, both physical and psychological, as a performer. I feel a significantly increased sense of security and ease while performing. Performances are less draining, therefore allowing me to continue growing as a pianist while ensuring my continued wellbeing. Now, when I approach a new piece of music, I do so with a great deal of curiosity. Right from the beginning, I allow the music to speak to me and I find ways of connecting with it. As I work through the piece to solidify any technical demands, ease and musical expression remain at the forefront. More and more, I am working to make technique a slave to the music, rather than allowing technical elements to change my expressive connection to a work. As I prepare for performance, my practice becomes less and less detail-oriented and more performance-centered, focusing on practicing how I will share the music with the audience and what I want to convey. This all helps to shift the emphasis towards the idea of music performance as a sort of gifting and opening of one’s heart to the audience. When the focus is shifted to sharing, the performer slowly begins to gaze away from the place of judgment and self-criticism. In our traditional training of classical music, these vital elements of the artistic practice are often neglected. As performing musicians, if we do not begin to attune to our bodies and our minds, the result is often burnout or, perhaps even more serious, a complete abandonment of the artistic career path. Love and passion drive the creative process but can easily be stifled by the sheer demands, expectations, and pressures in the performing world. It is vital, in my opinion, for all artists, but especially young artists, to seek out ways of retaining inspiration, motivation, and freedom of artistic expression while ensuring their wellbeing. I truly believe that this type of program should be essential for anyone in the performing arts field. Special thank you to Paula Wise for so willingly embarking on this mentorship project with me and for creating such a wonderful program for artists. Special thanks also to artsnb for your continued support of local artists. This is my fourth professional development project through the Career Development / Professional Development program. Each one has proven to be a unique experience that has truly had a positive impact on my professional career. After working with a young mother who loved her children deeply and felt the overwhelm that comes with very young children, she came up with this phrase. She made it into a poster and put it on her door as a daily reminder. I have always been a doodler since I was a child. Instead of feeling pressure to "make a work of art" with pastels or paint since I love art making but never seem to have the time, I have a sketch book handy in which I doodle when I am on the phone, just hanging out or waiting for an appointment. I then discovered that there has been some research on the art of doodling and its benefits - from expression of emotions too complex for words to a "mediator between the spectrum of thinking too much or thinking too little, which then helps you focus on the current situation". They even discovered through some testing that individuals who doodle have a higher memory retention when they are doodling while listening to information. I have introduced this to clients when they are struggling at home with emotions that are challenging. This kind of expression is spontaneous, non-pressured with no outcome in mind, and exploratory. The action of doodling seems to provide some internal ease and stress reduction. One client remarked that she was surprised by the outcome and that it felt good to see how she felt inside herself externalized right onto the paper. It felt freeing to just move the marker and delight in the colours. I started with lines and shapes. A face then appeared which was a nice surprise. Many individuals have recurring patterns in their doodles - mine is the circle which comes up in all my images. This is a client's doodle of her mood state. The next time she doodled it was completely different! Such a powerful display of her internal world.